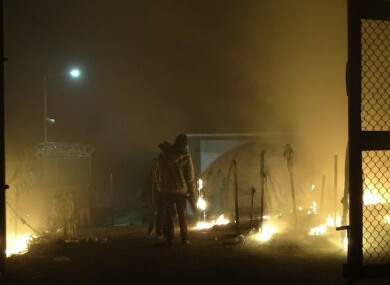 A fire burns at the Moria camp on the Greek island of Lesbos in late 2016. GREEK POLICE ARE investigating the deaths of three migrants in six days at a camp on the Aegean island of Lesbos, an officer said today. The police source told AFP authorities were awaiting a coroner’s report on the deaths of a 20-year-old Egyptian, a 46-year-old Syrian and a third man who has still not been identified in the badly overcrowded camp of Moria. One man was discovered on 24 January and another on 28 January. The two were found in the vicinity of the same tent, one inside, the other outside, the source said. The third man discovered this morning was believed to be around 20-years-old and from Pakistan. “We do not have signs that the deaths were drugs-related,” the officer added. The Doctors of the World charity also reported that one more man was taken to hospital today in a similar incident. The group added that poor conditions at the camp posed “serious risk” to the life and health of the refugees and migrants held there. Some Greek media have cited carbon monoxide poisoning as a possible cause of death, as the cold weather has forced some migrants to use wood-burning stoves to keep warm. The UN refugee agency, which helps the Greek government manage the camps, declined to comment. Greece has over 60,000 refugees and migrants on its soil, the result of a series of border closures in the Balkans and eastern Europe last year. Many of the camps are overcrowded, especially on the islands facing Turkey. On Lesbos there are nearly 5,000 people in camps nominally built to hold 3,500, according to government figures. The Greek immigration ministry has refused to permit large-scale relocation from the islands to the mainland, fearing that such a move could jeopardise an EU-Turkey agreement that has helped stop further arrivals to the continent. There are frequent brawls in the island camps, with the residents tired of the long wait for asylum papers and fearful of being returned to Turkey. Email “Greek police probe string of deaths in migrant camp”. Feedback on “Greek police probe string of deaths in migrant camp”.